Kubex products withdrawn from sale. Why? Kubex shower pods and enclosures - are they fit for purpose? The term 'one piece' is applied to many shower enclosures and pods. With the Kubex Compact and Kingston models this statement is one of fact as the two styles are fully assembled in the factory and delivered to your door ready to immediately accept your choice of shower equipment. The Kubex Profile 900 and Kubex Eclipse are exceptions in so far as they are delivered for assembly on site - their size would make it difficult to manoeuvre otherwise. Once assembled, the Profile 900 and Eclipse share all the watertight properties of their two smaller relations but with roomier internal space. The Kingston and Profile 900 cubicles are also available as corner models. The 'Kingston Corner' measurements being slightly different at 700mm x 770mm. With the exception of the Compact model, the Kubex Kingston range can be bought with a choice of Curtain entry, Pivot Door, Bi-fold door or Corner Entry. The Compact can be fitted with Curtain or Pivot door access. In the Profile 900 range you can choose from Curtain, Pivot Door, Bi Fold Door or Corner entry Models. This is the newest addition to the Kubex shower pod range. Designed specifically to install to an 800mm alcove, the pod is constructed from highly durable GRP and is available with a choice of door types (Pivot, Bi fold and Curtain entry)and frame colours. 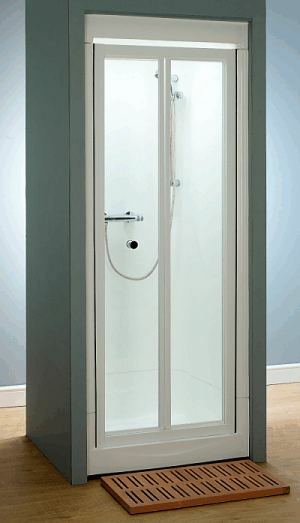 This alcove shower pod can sit directly onto floor boards (with waste running below floor) or with the use of the riser leg kit (supplied) can sit up allowing the waste to run above floor level - making it suitable where there are solid floors. The tall upstand moulded into the shower tray ensures water cannot find any way out at the back. Smooth curvaceous lines make clean simple. An option roof section completes the choice list. Please Note: The Kubex Eclipse is suitable for a 3 sided recess only. If used in a corner or mid-wall position additional side wall/s will need to be constructed to contain the pod. Kubex shower cubicles are supplied with a removable roof panel (with the exception of the Eclipse Alcove model that offers a roof section as an optional extra) . An optional corner seat is available on the Kingston model only and must be ordered at time of purchase as it cannot be retro-fitted. Please be aware, the optional seat is fairly compact and should not be confused with a full sized shower seat. Whether you plan to buy a Kubex and intend to install yourself, or wish to purchase and have a handyman install for you, there's no doubt you will save money. After all, time is money. With no tiling required and minimal plumbing necessary the job really couldn't be much simpler. 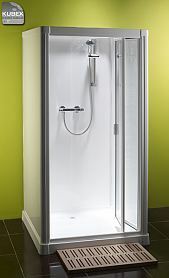 Once the shower equipment of your choice is fitted in the cubicle (shower equipment is not included in the price of Kubex shower cubicles) it really is a simple case of securing the cubicle into it's final resting place, connecting supplies and waste and the job is done. If you are intending to install a Kubex shower cubicle for somebody who has difficulty stepping up into the unit you should be aware of the different features within the Kubex range. The Compact and Kingston shower cubicles are supplied with legs upon which the cubicle sits. The legs (also known as compensators) adjust to take up any discrepancies in floor level and allow an 'above ground waste' to be run under the tray. Once correctly adjusted all is hidden from view by a plinth panel. As mentioned, the Eclipse can be installed directly on the floor (making access quite low) or on compensator legs. The Profile 900 sits directly on the floor naturally providing low access. Raising the tray height with legs may however cause an issue for persons who experience difficulty stepping up. If so, you might consider positioning an intermediate step outside the cubicle to reduce the transitional height. Alternatively, you might decide to install the cubicle flat on the floor (i.e. without the legs and plinth) hence reducing the step in height dramatically. Should you opt for the latter option you should bear in mind that the waste trap and pipework will need to run under (or within) the floor upon which the cubicle sits. The Profile 900 shower cubicle is not designed to sit on legs. This model sits directly on the floor and presents a minimal step upon entry or exit. Needless to say, the waste must be run below floor. Should you need to raise the Profile 900 to accommodate an above floor waste pipe this can be done by fabricating studwork for the cubicle to sit on. Kubex shower cubicles are supplied empty. Shower equipment shown is for illustrative purposes only. Kubex cubicles will accept most types of shower equipment. If you would like guidance or a package price please speak with one of our friendly staff. Remember, if you need advice please don't hesitate to contact us. We will always be pleased to help.